Last night members of UCL-Energy teamed up with the New Economics Foundation and the Royal Academy of Engineers to put on an event on wind energy at the Dana Centre in London. The ‘Crowdwise: Engineering the future of energy’ event began with a brief overview of some of the potential approaches and technologies that could be used to help the UK manage the supply side variability associated with large penetration of wind energy. 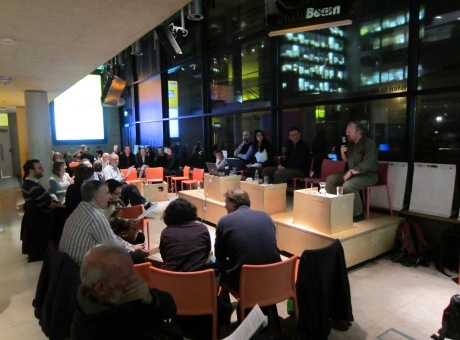 Around 50 members of the public listened to the UCL-Energy team introduce a range of themes. Tristan Smith, Lecturer in Energy and Shipping, debated the interaction of energy supply and demand and the pros/cons of on and offshore wind, Rokia Raslan, Research Associate in Energy and Buildings, discussed energy demand in the built environment and demand-side management, Andrew Smith, Senior Research Associate, spoke about supergrids and international distribution and Phil Coker, Honorary Research Associate, presented mixing renewable technologies on the supply side. This information was then used by the audience to develop their own suggestion for what the optimum mix of supply/demand/infrastructure technology might be in a future scenario that helps to meet the variability challenge. The audience then voted to choose their preferred solution. The event demonstrated not only how challenging it is to describe and discuss whole system energy questions, but also the broad range of opinions about what an optimum mix might be.